For the first time this season, I can officially say, “the Redskins win!” It is an exciting moment and one that was necessary going into the early bye week, but there is still a lot of work to be done. The game was not without its challenges and there were a number of injuries that could put Washington in a rough spot if players are not healthy by week 6 in Dallas. The most significant issues the Redskins are experiencing did not disappear this week, mostly the tackling and the struggles in the first half. The defense had another first half defensive touchdown, but the special teams gave up a touchdown and the defense missed on a number of tackles (maintaining their identity as one of the worst tackling teams in the league). The offense could not get started in the first half, but were only down by four at the break. The first half was a tale of uncoordinated efforts. Washington started with a 3 & out but were able to hold Oakland to only 16 yards and get the ball right back. The offense struggled again while backed up against its endzone and turned the ball over on a blocked punt run back for the TD. Finally getting their 1st first down, they immediately go 3 & out again. Matt Flynn, filling in for the injured Prior, got his first TD of the season to his backup TE. Washington finally got on the board in the 2nd quarter on a field goal, but got to back that up with an INT-TD by rookie Amerson. Both teams failed to get into scoring range for the rest of the half and retired with the 4-point difference. In the second half, Washington finally got the offense started. After both teams suffered quick drives for the first half of the 3rd quarter, Washington finally got in rhythm with a bit of the no huddle offense and scored a TD on an RGIII pass to Garcon. 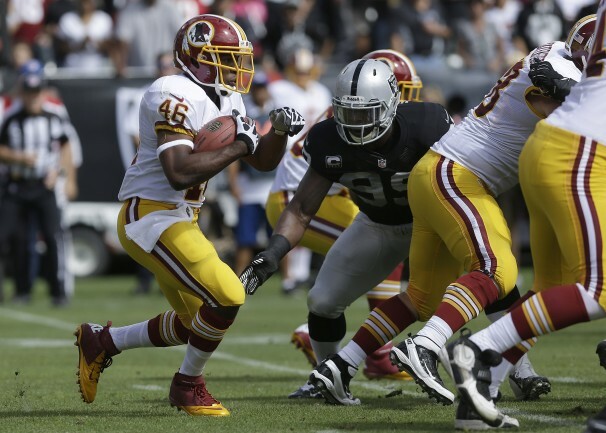 The rest of the game was about control, as the Redskins’ defense forced a turnover, racked up a number of sacks, and prevented the Raiders offense from getting a rhythm. With Morris going out due to an injury, Roy Helu Jr. came in and got his first TD of the season. 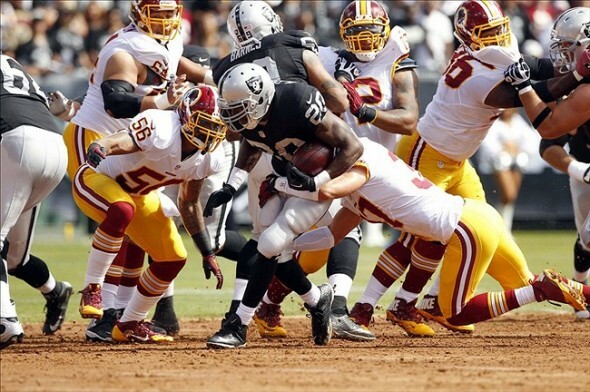 Morris struggled early against the Raiders defense but got going in the 3rd quarter. When he went out, Roy Helu Jr. looked good running out there too. RGIII had one questionable throw but was more on-target throughout the game and gave up no turnovers. The defense had its best showing of the season, holding the Raiders to the 14 points scored in the first quarter. The defense caused 1 fumble, 1 interception, and 7 sacks. Tackling is still a major problem for this team. The offense still started off way too slow in the first half. Injuries were rampant but the bye week could be just what the team needed. Special teams needs to work things out on both sides of the ball. Giving up the punt block and not finding a great returner are not helping with field position. Kaepernick got back on track with 2 TDs and significant help from Frank Gore to take out the divisional rivals, the Rams. The Bills forced Flacco to throw 5 INTS but suffered an injury to Fred Jackson in their close victory over the defending Super Bowl champs. The Browns got their 2nd win after the Richardson trade behind 2 TDs by Hoyer over in-state divisional rivals, the Bengals. The Lions surprise the undefeated Bears behind an impressive rushing attack by Bush. The Giants got a TD this week but were completely overwhelmed by the Chiefs passing attack and fall to 0-4. In London, the rushing attack by Peterson racked up 140 yards and 2 TDs to send the Steelers to 0-4. The Bucs managed to hold a 10-point lead into the 4th quarter but gave up 13 straight points to allow for the Cardinals to steal the win away from home. The Jaguars are the laughing stock of the NFL, losing 37-3 to Luck and the Colts. The Seahawks pulled off a late comeback that Houston fans had gotten accustomed to after being down 20-3 and winning 23-20 in overtime. The Titans may have lost Locker late in the game, but they decimated the Jets behind a strong passing attack. 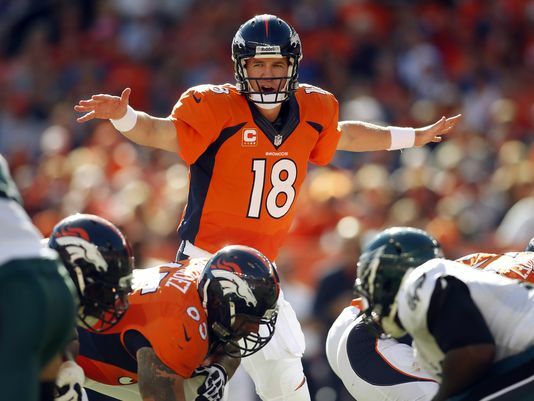 The Broncos are an unbeatable force behind Manning’s 4 TDs in a 52-20 wallop of the Eagles. The Cowboys had an excellent 2nd quarter but could not maintain their 21-13 halftime lead on the road at the Chargers. The Falcons squandered another opportunity to win by allowing the Patriots to take a significant lead and maintain it. Gonzalez was a bright spot for their offense though. Two teams entered 4-0 but the expected result behind the passing assault by Drew Brees led to the expected win by the Saints.